PORT MORESBY, PAPUA NEW GUINEA (12 September 2018) — Prime Minister of Papua New Guinea Peter O’Neill joined Asian Development Bank (ADB) Pacific Department Director General Carmela Locsin and ADB Country Director for Papua New Guinea (PNG) David Hill in inaugurating the new premises of ADB’s PNG Resident Mission today. Country Director of ADB’s Papua New Guinea Resident Mission David Hill, Prime Minister of PNG Peter O’Neill, and Director General of ADB’s Pacific Department, Carmela Locsin. “ADB has been our strong development partner since 1971,” said O’Neill. ADB’s PNG Resident Mission assists the government in implementing its Development Strategic Plan 2010–2030. ADB’s support is guided by its Country Partnership Strategy (CPS) with PNG for 2016–2020, which focuses on removing infrastructure bottlenecks and barriers to job and business creation in the country. 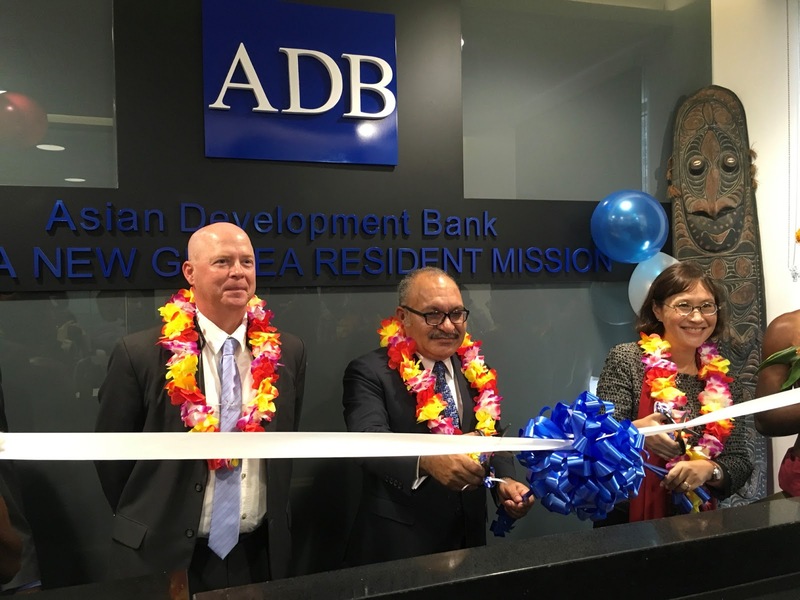 “ADB’s Papua New Guinea Resident Mission has boosted our responsiveness, allowed us to better align our programs to those of the government, and enabled us to expand our cooperation with other development partners,” said Locsin. PNG is home to both the largest population and economy in the Pacific subregion. In 2017, gross domestic product reached $23.1 billion and the country’s population was about 8.2 million. PNG recorded its 9th consecutive year of economic growth in 2017. ADB works with the Government of PNG to improve transport infrastructure, renewable energy, health, water and other urban infrastructure, and public sector management. For instance, the ADB-supported PNG Health Services Sector Development Program combines a policy-based operation and project financing to support sector reforms and investments in PNG, enabling long-term sustainability and effective use of the country’s health sector financing. The program will support the delivery of accessible, affordable, and high-quality health services in PNG. The ADB-supported Civil Aviation Development Investment Program is connecting people, goods, and essential services across PNG’s most challenging terrain. The project is strengthening the country’s land and air aviation infrastructure while improving safety and security in 21 national airports.